Reenactment of an applause captured in a photograph by Gerard Julien (AFP), taken 14 December 1995 at the Elysee Palace in Paris showing: Spanish Prime Minister Felipe Gonzales, US President Bill Clinton, French President Jacques Chirac, German Chancellor Helmut Kohl, British Prime Minister John Major and Russian Premier Victor Chernomyrdin, Serbian President Slobodan Milosević, Croatian President Franjo Tuđman and Bosnian President Alija Izetbegović applauding after signing of the peace agreement on Bosnia. The accord was reached in Dayton, USA, 21 November ending over four years of war in former Yugoslavia. 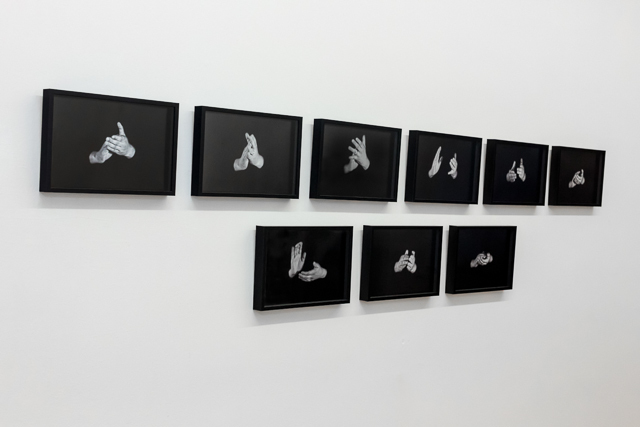 Installation view, Gandy Gallery, Bratislava, 2013.